ANAHEIM, CA (March 17, 2017) — Artists Republic is pleased to cap off the first day of WonderCon by hosting a special collectors preview for our upcoming showcase, Son of Skywalker: The Awakening, a large group exhibition celebrating the Star Wars saga. Being that this is our third annual Star Wars group show, Artists Republic is especially thrilled to have our opening coincide with WonderCon and its return to the Anaheim Convention Center. Artists Republic Gallery’s first Son of Skywalker exhibit in 2015 featured characters from the light side, and last year’s show “Son of Skywalker: Imperial Uprising” focused on the Dark Side. This time around we are excited to bring everyone together in “Son of Skywalker: The Awakening” which includes a broad array of mixed media art works created with pure joy and love for Star Wars. We are very proud to host work from the 501st Legions’ Dawn Bright who will have a set of her hand made costumes on display. Dawn is one of the top costume makers for The 501st which is an all volunteer global costuming organization whose members make appearances at casual, promotional, and charitable events bringing community spirit through mutual love of Star Wars. In addition, we are happy to exhibit the #1 of Lawrence Noble’s bronze Darth Vader statues, of which only 12 exist. Regarded for his legendary Yoda Fountain, famously housed at Lucasfilm’s Presidio headquarters, Noble is also well-known for his 1984 LA Olympics gold medal design. “Son of Skywalker: The Awakening” also includes notable sculptural works from UK artist RYCA, paintings from local artists Randy Noborikawa and Brian Bent, as well as works on paper, prints, posters and much more. The talented group of artists included in this exhibition come from near and far to honor one of the greatest movie sagas of all time. Since opening its doors in 2010, Artists Republic has been one of Orange County’s premier venues for new contemporary art. Previously located in Laguna Beach, CA, the gallery is dedicated to the support of emerging and mid-career artists whose work has impacted and influenced lives through youth culture. Artists Republic is located at 400 Disney Way in Anaheim, CA and specializes in original works, prints, books and more. www.artists-republic.com. The New Contemporary movement, widely acknowledged to have begun in the early 90’s on the West Coast, evolved in reaction to a conceptual turn in fine art. Founded in part on a rejection of the arbitrary division of visual culture that tends to elevate “high art” above the social and popular realms, the movement invoked the countercultural and drew content from an immersion in social experience. The standard of excessive academicism and abstraction, against which it grew, was commonly held in higher regard than more figurative, graphic or representational forms of art. This marginalization inspired the New Contemporary movement to set its own terms and create its own context for the reception of its work. With a renewed emphasis on technical skill, narrative and representation, it has encouraged a social return in art. Moving away from the standard art education model that demands graduate school, an excess of critical rhetoric and an art world careerism, these artists, many of whom are self-taught, have sought their own inspiration and voice instead, drawing on everything from popular culture and social media platforms, to street art, murals and graffiti. By creating a distinct community in support of the diversity of its visions and styles, the movement has mortared and upheld its own invisible school. 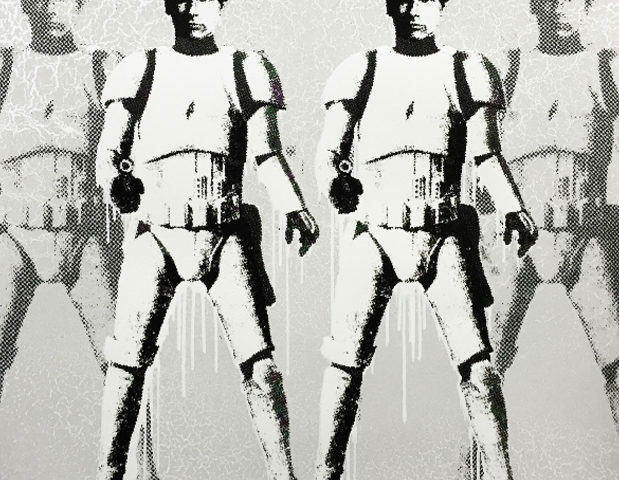 The group exhibition “Son of Skywalker: The Awakening” opens Friday, March 31st from 6 to 9pm. Many of the artists will be in attendance. Show runs March 31st – May 7th, 2017 at Artists Republic Gallery, 400 W Disney Way Suite #137, Anaheim, CA. Parking in garage, first hour free. Works are for sale. Gallery hours: Wed-Sat 12pm-9pm, Sun 12pm-6pm, and by appointment. www.artists-republic.com. Thank you to Artists Republic for the press release and images.